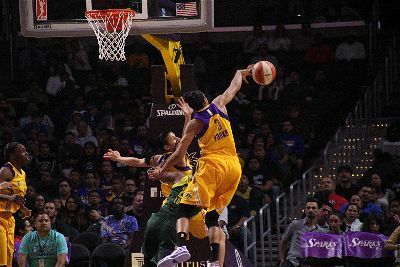 Candace Parker swats the ball away. Photo by Benita West/T.G.Sportstv1. 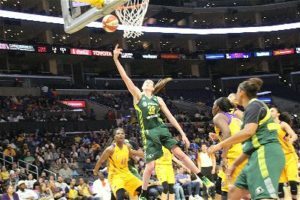 Los Angeles, Calif. – The Los Angeles Sparks dominated the Seattle Storm Sunday, 96-66, in the season opener for both teams. 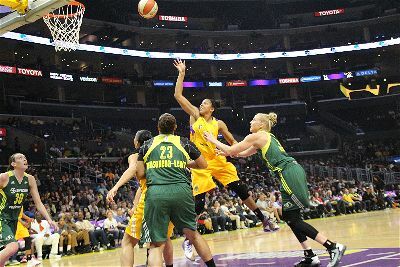 Candace Parker lead the way for Los Angeles with 34 points, while Kristi Toliver added 14 and Nneka Ogwumike, 13. No. 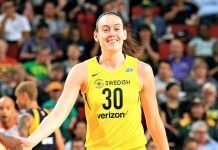 1 draft pick Breanna Stewart lead Seattle with 23 points, and teammate Jewell Loyd put up 20. Breanna Stewart lays it up and in. Photo by Benita West/T.G.Sportstv1. The Sparks got off to an aggressive start, shooting a blistering 73.3 percent in the first quarter to mount an 11-point lead. They stepped up the defense in the second period, limiting Stewart and Loyd to 2 and 4 points, respectively. Parker had 21 points by halftime, as the Sparks lead 51-26. 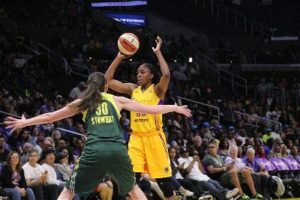 The tables turned in the third quarter, as Los Angeles shot only 33.3 percent while the visitors shot 75, and Stewart went off for 13 points. They outscored the Sparks, 25-14. But Parker re-ignited in the last period, scoring nine points, while Essence Carson added six. Stewart was limited to one point. Nneka Ogwumike looks to pass. Photo by Benita West/T.G.Sportstv1. Statistics for both teams were fairly even except for one: turnovers. 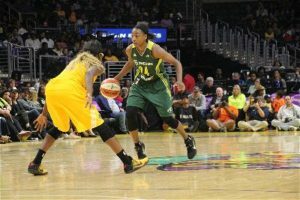 The Sparks forced the Storm into 24, and scored 30 points off of those miscues, while keeping their own at ten. Los Angeles coach Brian Agler said he was pleased with his team’s overall consistency. Both teams have largely rebuilt rosters this season, with much expectation on both sides. 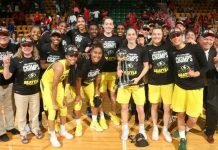 Parker was inexplicably left off the 2016 Olympic team a few weeks ago, and Stewart is seen as the future of the Storm and integral to the promotion of the WNBA. Parker said the Sparks are off to a good start with the win. 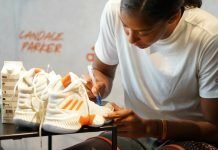 Candace Parker and the hook shot. Photo by Benita West/T.G.Sportstv1. Storm coach Jenny Boucek acknowledged that her young team “has a lot of work to do,” but said she relishes the process. 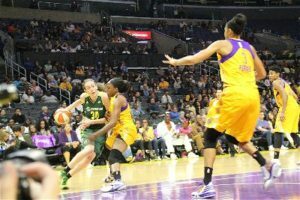 Breanna Stewart drives into the lane against Nneka Ogwumike. Photo by Benita West/T.G.Sportstv1. The meeting is the only one for the two teams in Los Angeles this season.